Like Fincher, directors such as Michael Bay, Antoine Fuqua, Michel Gondry, Spike Jonze, Alex Proyas, Paul Rachman, Mark Romanek, Zack Snyder, Gore Verbinski and others honed their talents at Propaganda Films before moving on to feature films. Though he would continue to direct spots for Levi's, Converse, Nike, Pepsi, Revlon, Sony, Coca-Cola, Chanel, and other companies, Fincher began to focus on music videos. He directed the video for 1986's "We Don't Have to Take Our Clothes Off", which was the biggest commercial success for pop/R&B singer Jermaine Stewart, Michael Jackson's "Who Is It", and worked extensively with Madonna, directing videos for "Express Yourself", "Oh Father", "Vogue" and "Bad Girl". He also directed Billy Idol's "Cradle of Love" video. Fincher referred to the production of music videos as his own kind of film school, in which he learned how to work efficiently within a small budget and time frame. After directing the film, he retreated back into the world of commercial and music video directing, including the video for the Grammy Award for Best Short Form Music Video-winning song "Love Is Strong" by The Rolling Stones in 1994. Following the difficult production of Alien 3, Fincher thought that he would "rather die of colon cancer than do another movie" and eschewed reading scripts. Despite this, Fincher read Andrew Kevin Walker's screenplay for Seven (1995), which was actually Walker's original draft with the current ending, that was already removed by then attached director Jeremiah Chechik. Fincher expressed no interest in directing after reading the revised draft, until New Line Cinema agreed to keep the original ending. It stars Brad Pitt, Morgan Freeman, Gwyneth Paltrow, R. Lee Ermey, and Kevin Spacey, and tells the story of two detectives (played by Pitt and Freeman) tracking down a serial killer who bases his killings on the seven deadly sins. Seven was one of the highest-earning films of 1995, grossing more than $320 million internationally and was positively received by film critics. Writing for Sight and Sound, John Wrathall wrote that it "stands as the most complex and disturbing entry in the serial killer genre since Manhunter" and Roger Ebert opined that Seven is "one of the darkest and most merciless films ever made in the Hollywood mainstream." ^ Knapp, Laurence F. (2014). David Fincher: Interviews. Univ. Press of Mississippi. p. 95. ISBN 9781626741928. Retrieved February 6, 2019. ^ Director's Cut: Picturing Hollywood in the 21st Century. Bloomsbury Academic. October 15, 2006. ISBN 978-0826419026. ^ "Seven". Box Office Mojo. 1995. Retrieved September 14, 2010. ^ James White (October 9, 2015). "David Fincher Will Direct The Full First Season Of HBO's Utopia | News | Movies - Empire". gb: Empireonline.com. Retrieved November 7, 2016. ^ a b c Rodrigo Perez (May 22, 2016). "David Fincher's 'Utopia' With Rooney Mara Is Dead At HBO, 'Videosyncrazy' Might Be DOA Too". IndieWire. Retrieved November 7, 2016. ^ Otterson, Joe; Otterson, Joe (April 19, 2018). "'Utopia' Lands Series Order at Amazon, Creator Gillian Flynn Inks Overall Deal at Studio". Variety. Retrieved January 25, 2019. ^ "David Fincher Helming Torso". Coming Soon. Retrieved December 7, 2007. ^ Fleming, Michael (November 1, 2007). "Paramount, Fincher catch 'Killer'". Variety. Retrieved August 14, 2009. ^ John Horn (April 24, 2014). ""The Library" Rewrites The Book On Columbine". LA Times. Retrieved November 22, 2018. ^ "David Fincher and James Ellroy Developing HBO Series Shakedown - /Film". Slashfilm.com. December 18, 2014. Retrieved November 7, 2016. ^ Andreeva, Nellie (December 18, 2014). 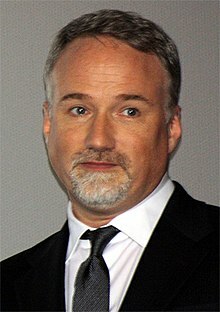 "David Fincher Shepherding HBO Comedy About 1980s Music Video Industry". Deadline. Retrieved November 7, 2016. ^ "'World War Z 2' Filming Date Revealed; David Fincher Still Directing". Collider. October 9, 2018. Retrieved October 10, 2018. ^ Sharf, Zack (February 6, 2018). "David Fincher and Brad Pitt's 'World War Z' Sequel Dead At Paramount". IndieWire. ^ "David Fincher • Great Director profile • Senses of Cinema". Sensesofcinema.com. April 24, 2002. Retrieved November 7, 2016. ^ Pierce, Nev (September 27, 2014). "David Fincher on Gone Girl: 'Bad things happen in this movie…'". The Guardian. ISSN 0261-3077. Retrieved February 19, 2016.